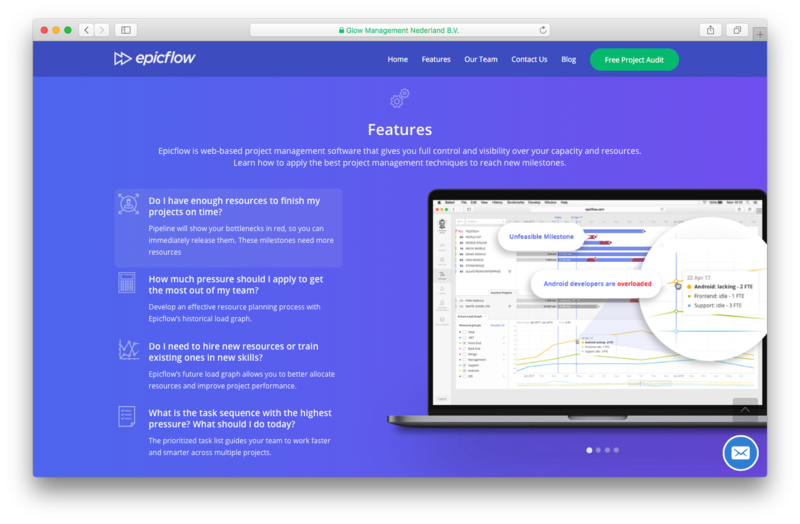 "Epicflow is a powerful solution that makes multi-project environments easy to lead and manage. " Epicflow scored 82/100 in the Resource Planning (ERP) category. This is based on user satisfaction (88/100), press buzz (25/100), recent user trends (falling), and other relevant information on Epicflow gathered from around the web. Epicflow is an online management platform. It tracks the tasks you assign to your employees and monitors their progress. This includes the deadlines, the amount of work done, the number of projects they have, and other details. With a predictive statistics engine and data that’s easy to interpret, you can use this software product to plan your projects effectively and improve your work force’s efficiency. Epicflow lets you monitor each of your team’s projects. You can monitor their progress as they work on the various tasks on each one. Tasks can be assigned to units based on their position and/or the urgency of the project or task concerned. 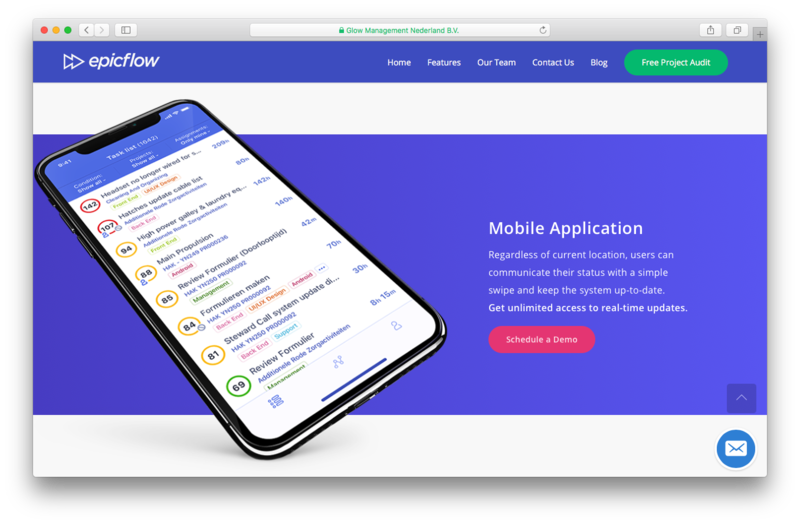 Recognizing that most companies experienced variants of the same set of issues, Epicflow created a one-stop solution to cater to the needs of a variety of employee and project management aspects. The Epicflow focus on improving project completion discovered that work overload, employee performance, and overall project planning are the main causes of delay. To combat this, Epicflow developed the Flow method. Flow is an algorithm that focuses on the general progress of each task and project. This algorithm checks the overall status of a project, how many are finished, and who is working on what assignment. It then computes and identifies possible choke points in the system. These points are areas that can be potential sources of delay. It can also notify you of these choke points, and tell you what type of delay is going to be caused. One of the application’s main purposes is to help schedule and plan out tasks for your staff. It also lets you view upcoming or overdue tasks, or filter individual projects based on the company and deadline, the employees assigned, and the amount of progress completed. All of this information can be viewed on a dashboard optimized for viewing via a desktop computer or a mobile device. Each task can be assigned according to the department or a specific employee. These can then be given a corresponding tag or name to make it easier to find. You can assign one user to several projects at a time, or several users to one project simultaneously. Whenever you do this, the program will present you with a variety of possible completion scenarios, including time until completion and overload warnings. You can also create urgency and priority levels for each task. Once you create these tasks, they appear on a graphical chart that shows how they are progressing. You can use this to see if your employees are working effectively. There is also a history load chart that can be used to see the prior work performance, capacity, load, and output from previous projects. This can be used to re-evaluate different departments or staff members. You can use this to create charts that show each previous performance according to a timeline. The future graph chart lets you track each possible outcome from your work plan. You can use this to plan your resources better and find the ideal plan of action. This helps you pinpoint feasible or infeasible milestones, lacking materials or staff members, and mandatory tasks for each project. Thanks to the graphical chart pipeline, you can predict and assess areas that are likely to cause a bottleneck. These occur due to a lack of either resources, effort, or manpower and could prove disastrous unless resolved. The graph lets you trace when the problems occur and at what point they might occur. The Epicflow reporting system lets you analyze any given pair of data efficiently. Any metric or statistic can be recorded and compared with this tool. You can use either the platform’s own reporting system or get other third-party software to do this for you. When you want to create your report, you can use data from previous sessions and import them into the system. Once gathered, you can graph it in order to check on how your employees are performing. You can also use this individually, and see if they can properly perform tasks you might assign them. You can also export data. Any data that has been captured can be sent these to various third-party software. Epicflow is mobile-friendly and can be accessed both on mobile and on a desktop. It is fully mobile responsive and you can easily use this software solution even when traveling. It comes with real-time updating to inform you and your staff members about any changes. Several third-party software solutions can be integrated into the system. You can add different management platforms to create different work environments or better analysis. These systems include Topdesk, Jira, and MS Project. Epicflow stands out thanks to its focus on employee output, performance, and resource planning. Unlike other software, Epicflow considers the actual labor employees funnel into their individual tasks rather than relying on a results-only approach. It keeps track of each individuals progress and charts how much work they have done. The features to watch for in Epicflow are its overload detection and predictive graphs. The overload detection considers the employee’s previous performance and estimates how many tasks each one can take. This can also help you avoid clogging your workflow and delaying progress in any of your projects. The predictive graphs similarly consider the employee’s previous performances. This time, it uses the data to predict how much time and labor will be needed to accomplish a task and how much effort the employee would likely exert. This can help you plan the right staff members for certain assignments and can serve as an overall evaluation of your workforce. Another benefit in Epicflow is its notifications system. It analyzes data and performance to detect any possible problems or issues that may arise. These include details about milestones that may not be accomplished, tasks that are falling behind in daily progress, and upcoming deadlines for different projects. Unlike other systems, Epicflow detects these problems before they occur to give you more time to resolve it. Epicflow’s software is an online and cloud-based SaaS with a demo upon request. You can email the company to ask for a free trial for an undisclosed amount of time for either your desktop or your mobile device. If you choose to buy the platform, you need to contact the company to get the price information. This is dependent on the type of business and the size of your organization. Project pipeline – Build an overview of your company’s projects and progress for each. Data import and export – Save data from previous reports and graphs in an archive. Once retrieved, you can import it to run different reports or export them to other management programs. Multiple users – Several users from your company can be added and assigned to various projects. Multiple projects and tasks – Create and assign several projects and tasks simultaneously. It comes with deadlines and progress tracking. API notifications – The system sends you and your employees notifications such as task changes, overload detection, and choke point detection. Real-time updates – All notifications and changes in the system are updated online and in real time to keep you properly informed anytime and anywhere. Scheduling – Set various deadlines and other important dates for each project such as demonstrations, submissions, and releases. Data visualization – Create different charts based on several factors including your employees’ prior performances and workload. History load chart – Part of data visualization. Previous tasks, performance, capacity, and outputs of employees can be charted to benchmark growth and consistency. Future chart – Part of data visualization. Data from the history load chart can be used to predict possible outcomes for tasks you assign. This includes progress per day, the likelihood of success, and time until completion. Mobile integration – The platform comes with a mobile version for download. With this, you can stay informed about each task and project anytime, anywhere. Epicflow is an online project and task management platform. It has several features for managing your resources such as work assignment, employee directory, third-party integration, task scheduling, and deadline settings. Its standout features include an overload detection system, a smart notification system, and predictive graphs. The platform comes with a price upon request. This software product is recommended if your company wants to further streamline work schedules that focus on the daily performance of employees. Does Epicflow offer multi-user capability (e.g. teams)? What is Epicflow generally used for? Who are the main user groups of Epicflow? Does Epicflow integrate with any other apps? Does Epicflow offer guides, tutorials and or customer support? What platforms does Epicflow support? Does Epicflow offer an API? What are some applications Epicflow is commonly used in tandem with? 4.42/5 based on 13 user ratings. What do you like about Epicflow? to upgrade this PM system to the multi-project level. What do you dislike about Epicflow? Epicflow has a number of useful features and gives us the ability to see the progress of multiple projects. load graphs to one dashboard in the near future. What have you been using it for and what problems did Epicflow solve? There is no need to ask busy people about the progress. The pipeline is dynamic and always up to date. It’s easy to work and keep as much control as possible. No need to replace Jira, just add value to it with Epicflow. Additional tools come with additional rules. So you should educate your team and your clients. If you have problems with prioritization for multiple teams, overload and overhead, it might help you very much.